Summary: There is no denying that the RevXtreme Exercise bike looks impressive – the question is whether the build quality and spec make it a viable rival to quality bikes from JTX or JLL? This is set up like a spinner, and has a very heavy flywheel. 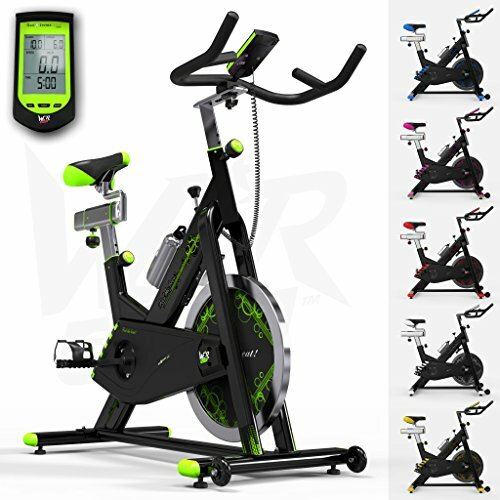 This is a mid-priced bike, aimed at those who know they enjoy spinning / indoor biking and want to invest in a higher quality item. The feedback from buyers has been very positive so far, and this bike also comes with free home delivery. You can check out the distinctive good looks of this bike from several angles on this dedicated amazon.co.uk product page. This bike comes in green, blue and red variations, and all models use the colour schemes well to highlight the tips and provide decoration for the big flywheel. The RevXtreme ergonomic handlebars put this bike into the spinning category – it only bears the closest resemblance to an old-style traditional home exercise bikes. In addition to the sleek looks you’ll find a lot of attention to detail. There is a water bottle holder, adjustable saddle, and the height of both the handlebars and seat are adjustable to help you find the perfect spinning position. Non-slip pedals keep you from slipping off the pedals and losing momentum (or even bashing your shin!). You can move this spinning bike around your house thanks to small rubber wheels attached to the base. This exercise bike is powered by a heavy 22kg flywheel. This improves the overall smoothness of the resistance. The resistance is adjusted manually. When you first start you can keep this light, though the higher levels will be a challenge unless you are already fit. You’ll get a simple console, with big numbers in black giving you all the key information. This includes the distance you have cycled, the calories burned, time and speed. You can set this console to scan through these as you ride. There is only limited assembly needed for this model (you need to put the pedals and saddle on, then adjust the heights of the saddle and handlebars). This saved the RevXtreme Spinner from some loss of points – there are big complaints whenever assembly is needed! In general, the feedback is very positive. The resistance came in for specific praise. One commenter mentioned that this went up to ‘almost impossible’. One zero rating was given because the bike did not match those at the gym. I wonder if this buyer knew that those commercial bikes cost up to 10x as much the feedback would be the same? Overall, a positive view from those who previously purchased this item. As mid-priced spinning style home exercise bikes go, the RevXtreme Exercise Bike ticks all the right boxes. The good looks are easy to spot, though the main benefits are the big flywheel (for a smooth ride) and the attention to detail for the rider. This is certainly one for your shortlist. Check out the impressive gallery and that buyer feedback over on the dedicated amazon.co.uk product page now!